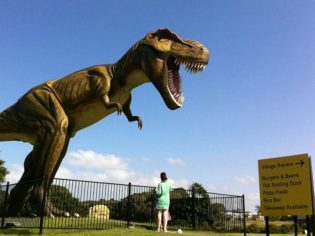 Roaring Understatement: Jeff the animatronic T-rex surveys Palmer Coolum's immaculate (former PGA ) golf course and club house. A solo musician wearing a white sports jacket croons John Farnham’s Burn For You on the Village Square stage to an audience of three. An hour later, when I cycle past, his energy hasn’t abated but the crowd has – every table in the courtyard of Palmer Coolum Resort’s restaurant hub is deserted. At least staff at Burgers & Beer and The Smiling Duck appreciate his determination. The best way to cover Palmer Coolum’s well-manicured grounds is by cycle (covered by the ‘resort fee’). Away from the stage, the silence is vaguely eerie. Only a handful of families wander around the sprawling property, the antithesis of the energy that Coolum town radiated as my shuttle bus passed through; runners, walkers, shoppers and swimmers unfurling themselves in the toasty Sunshine Coast morning. But as the bus enters the resort, past a tall Titanic II billboard, it’s clear I have entered the realm of mining magnate, namer-and-shamer of Chinese spies, and political powerbroker, Clive Palmer. If you squint, the resort still bares familiarity with the Hyatt Regency Coolum it once was. (The billionaire bought the apparently struggling property in 2011, reportedly for $70 million). Its setting is sublime: dramatic Mt Coolum oversees all, its slopes are clothed in bush that gently flows into the resort’s landscaped grounds and golf course, which is also mostly deserted. But something else takes our collective breath away in the shuttle bus as we round the final bend. 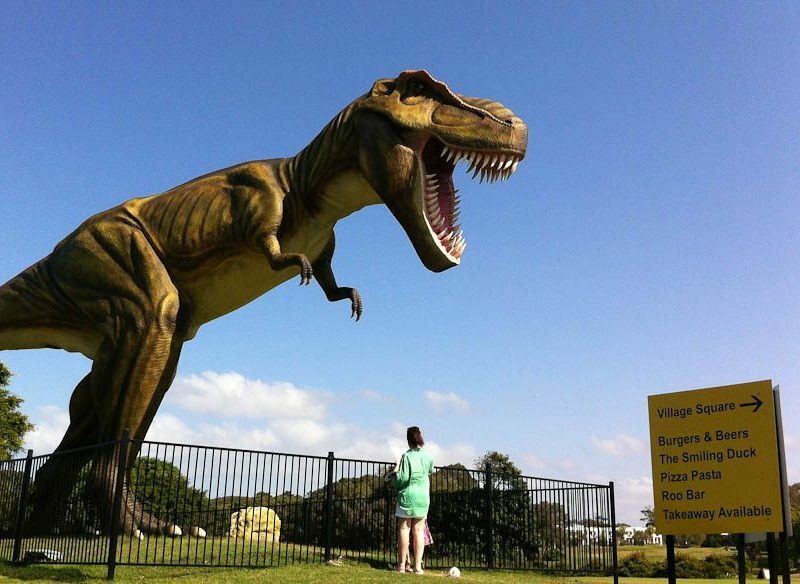 With gasps, giggles and guffaws, emerges Jeff, a 10-metre tall animatronic T-Rex. Jeff is no sideshow, he is the centrepiece – impossible to miss as you enter the resort, perched next to the golf course’s ninth green by the ‘John Fitzgerald Kennedy Lake for World Peace’ water hazard. Once upon a time the Hyatt Regency would house rock stars, heads of government and host its own PGA golf tournament, but Clive’s ‘little touches’ have transformed his playground into an entirely different kettle of dinosaurs. At reception, a Palmer United Party campaign bus is parked front and centre, the sides graced by Clive with his thumbs up and a manic grin. Nearby, another Titanic II poster looms above. Yabba-dabba-do: A Cartoon version of Clive advertises his eponymous grill. Vintage cars in mint condition are randomly parked inside and out, like a pre-WWII traffic jam – an incongruent addition to the empty grill restaurant and old-world snooker room. The ‘Motorama’ museum, with 50 more cars from Palmer’s personal collection, will increase traffic even more when it’s due to open in December. Suddenly the 20-metre concrete crocodile behind my room isn’t so surprising. Further down, a compound of still-wrapped dinosaurs stand behind a fence, ready to pounce, at Clive’s whim. Another Clive surprise: A 20-metre concrete crocodile guards the entrance to the Village Square. Inside my King Junior suite, although clean and spacious, is a mish-mash of louvers, cane, pastel fabrics and tired 1980s-it-was-a good-idea-at-the-time touches. There’s only so much that scrubbing and repainting can achieve. The promised double bed is actually two joined singles, with a difference of a centimetre in height – just enough to make an annoying ridge. The fixtures seem like original items from the Hyatt Regency days, as does the dated clock radio – and not in a charming vintage way. The mini-bar is turned off and has a complimentary puddle in one of its trays. At least the dinosaurs haven’t infiltrated the rooms… yet. The King Junior suite: clean, comfortable but needing a refresh. On television, five channels of Clive reinforce the fairytale: Titanic, the movie, and some of his recent interviews on perpetual loop. Propaganda lessons learned from the Chinese, perhaps? Cycling around the grounds, I conclude this make-believe world must be pitched at kids – my nine-year-old self would revel in this wackiness. Scoff a Titanic Burger, chase around the scores of kangaroos that freely spring around (far outnumbering guests); catch an afternoon Kids’ Club activity (maybe archery); and head down to Jeff to repeatedly press the button that provokes him to roar and sway (which incidentally frightens the hell out of the younger kids). But what’s in it for mum and dad? The food options at Palmer Coolum have changed somewhat compared with the resort’s Hyatt Regency days. The service is country-town friendly, there is a kitted-up day spa, a secluded beach club and the still-phenomenal golf course. If you ignore the tacky names, there are a few decent food options too. Ned Kelly Restaurant serves an admirable three-course special for $30, with doting one-hand-behind-the-back service. Admittedly, I was the only one in the restaurant. Unfortunately, the fine dining Captain’s Table was closed at the time. Enough to justify the visit? Probably not for the discerning AT reader: it’s not Willy Wonka’s Chocolate Factory yet, but it’s a generation away from the Hyatt Regency in its heyday. Clive’s proposed $2.5 billion redevelopment of the site, complete with casino and hovercraft shuttle from Brisbane, may well be worse than what it is now. But if you’re in the area, it’s worth a daytrip, if for nothing more than the spectacle. Some of the Palmersauras exhibits stand ready to be unleashed. The verdict: It’s in transition between a once successful five-star stay and the world’s largest dinosaur theme park. The kids might like it but one night was enough for me. We rated: The committed and friendly service, the spectacular outlook, the range of activities for children and the golf course. We hated: The tired-looking accommodation and the lack of subtlety (read: large yellow signs everywhere). Overall a lack of attention to detail. Palmer Coolum Resort from the air shows little of the ‘personality’ that Clive has since added to the former Hyatt property. Notes: Steve paid $199 for one night in a King Junior Suite plus $9.95 resort fee.